Telangana Postal Circle Recruitment 2017|Telangana Postal Circle invites application for the post of 08 Postal Assistant/Shorting Assistant, Postman/Mailguard & Multi Tasking Staff for Sports Persons. Apply before 02 January 2017. For Postal Assistant/Shorting Assistant : 12th class pass from any recognized Board or University. For Postman/Mailguard & Multi Tasking Staff : Matriculation/SSC from any recognized Board or University OR ITI or equivalent from any recognized Board or University. Selection Process : Selection of candidates will be made on Educational & Sports Qualification. Application Fee : Cost of application form Rs.100/- for all categories of applications through MPCM receipt in Telangana Postal Circle. 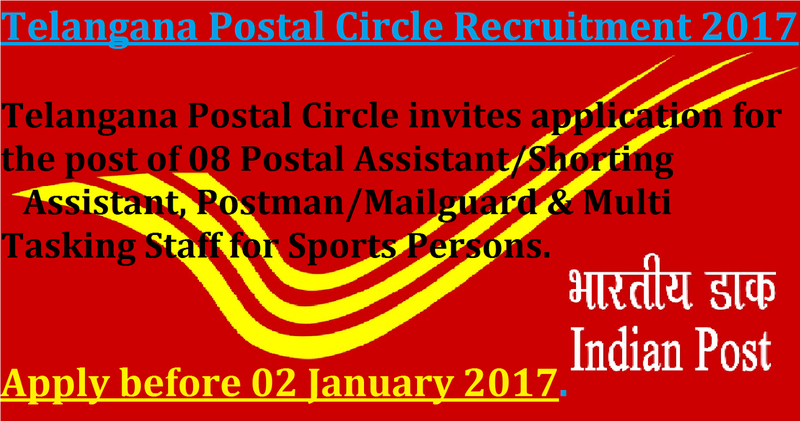 How to Apply : Interested candidates may apply in prescribed application form along with relevant documents send by speed post/ Regd post to Chief Postmaster General, Telangana Circle, Hyderabad-500001 on or before 02.01.2017.